Bristol City have had a bid accepted for Crystal Palace forward Dwight Gayle, says manager Steve Cotterill. But the Robins are yet to hold talks with the 24-year-old striker, who would have to drop a division to sign for the Championship newcomers. 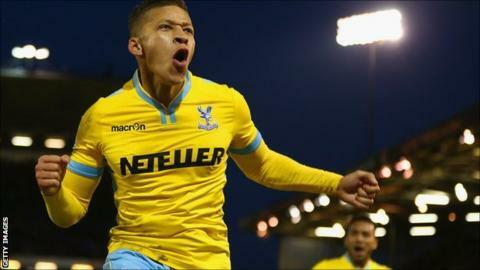 Gayle, who joined Palace from Peterborough for £6m in July 2013, scored five Premier League goals for the Eagles last season. "He is a player we'd really like," Cotterill told BBC Radio Bristol. "We've had a bid accepted, there is not too much to elaborate." Cotterill said he had held "numerous conversations" with Palace chairman Steve Parish before a deal was agreed. He added: "It is down to the player whether he wishes to talk to us. He would be a good addition to our squad should he choose to join us." City have been have been largely frustrated in their attempts to recruit players for the new season, with owner Steve Lansdown admitting he has been shocked by the cost of players in the Championship. The club, who lost their Championship opener on Saturday, have signed striker Jonathan Kodjia, wing-back Ryan Fredericks, goalkeeper Ben Hamer on loan from Leicester and forward Callum Robinson, who joined on a season-long loan from Aston Villa.